Genre: Sandbox. Other versions: X360. 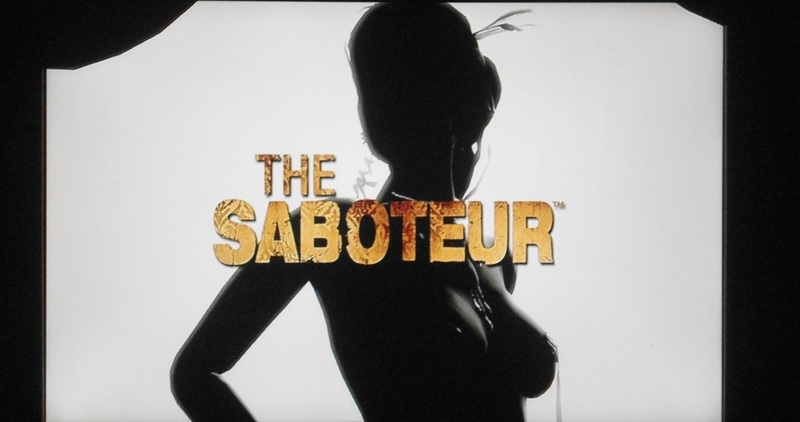 The Saboteur adds to a growing list of open-world titles that position themselves between Assassin’s Creed’s free-running exploration and Grand Theft Auto’s gun-toting action. A beautiful, expansive wartime setting of Paris under Nazi occupation threatens to set it apart from the competition, though clumsy controls and by-the-numbers mission design sabotage its path to greatness. Irishman Sean Devlin is a foul-mouthed, drunken womaniser and all-round protector of old-fashioned stereotypes. He’s washed up in a Paris club after his friend Jools is killed by the Nazis prior to their invasion of the city. It just so happens the French Resistance decide to put him to use as a saboteur, and thus begins a journey that is driven by vengeance, colourful language and lots of explosions. It’s about as stylish a location as you’re likely to find in recent gaming. Areas of Paris with a strong occupation presence are appropriated in a dreary, black and white monochrome, punctuated by shock-red swastikas and symbols of oppression. 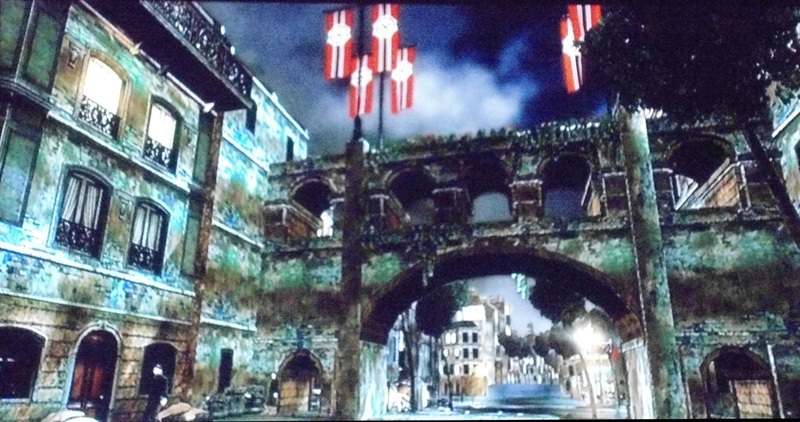 Complete a key sabotage operation however and before you can say ‘it’s like Okami with Nazis!’, a burst of colour rushes through the area, signifying new life in its resistance. The missions are the usual mix of defeating key baddies, blowing up fuel depos and driving from A to B. There’s no major hiccups, but also little to inspire gamers who’ll have seen such challenges many a time before. Still, how you go about your sneaky business is a little bit different. There’s a whole stealth/suspicion element built around Devlin’s actions, and learning to remain undetected becomes an art unto itself. The ‘sneak in the city’ idea deserves credit, as whilst open streets don’t seem especially conducive to such play, it’s actually pretty novel, if a tad muddled in places. Sneaking or carrying a gun is deemed suspicious, unless Sean dons a Nazi uniform. In disguise, running earns unwanted attention, and indeed walking too close to genuine Nazis. Should the suspicion metre turn red, you’ve got a split second to take down the alerted foe before he can blow his whistle and bring a host of goose-stepping buddies after on you. This is a nice mix up from the regimented police presence most titles go for, though it can go awry, such as when you’ve been seen killing a Nazi, you can inexplicably halt the suspicion bar if you don his clothes, even whilst being watched. Despite sporting a fairly superfluous cover system, shooting in The Saboteur is clean and precise. Taking out Gestapo officers with a headshot from a silenced pistol at distance is super-satisfying, whilst a range of room-cleaning machine guns prove handy in livening up bigger battles, and taking down zeppelins with a rocket launcher is an awesome sight. There a number of nifty ways to end a Nazi alert, including grabbing a kiss from handily-placed French women, or hiding in shacks/skylights. The A.I. is pretty much useless at pursuing over rooftops or through the countryside however. Whilst the shooting is really good, the platform element is a bit of a catastrophe. The ability to free-run and scale buildings has granted the likes of inFamous and Prototype a liberating sense of freedom and depth, but here it has the reverse affect. Devlin isn’t a superhero, and as such takes forever to climb structures, usually making a right meal of doing so to. Tough there’s little questions the range of iconic buildings were lovingly mapped, few leave you with the impression they were ever rendered to accommodate gaming. 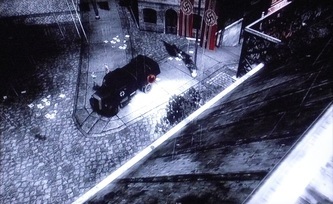 It’s a problem exacerbated by the unhelpful and frequent inclusion of built up enclosures that leave no easy access back to the streets without having to climb back out, whilst the lead protagonist has an irritating habit of turning round and hanging from small ledges when you’d rather he dropped down instead. 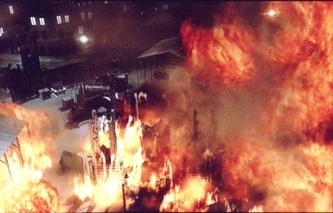 Devlin also can’t handle big drops, so whilst it’s tempting to fling him back to ground level to save time, it often results in his death, leaving you back at one of a small handful of safe houses around Paris. 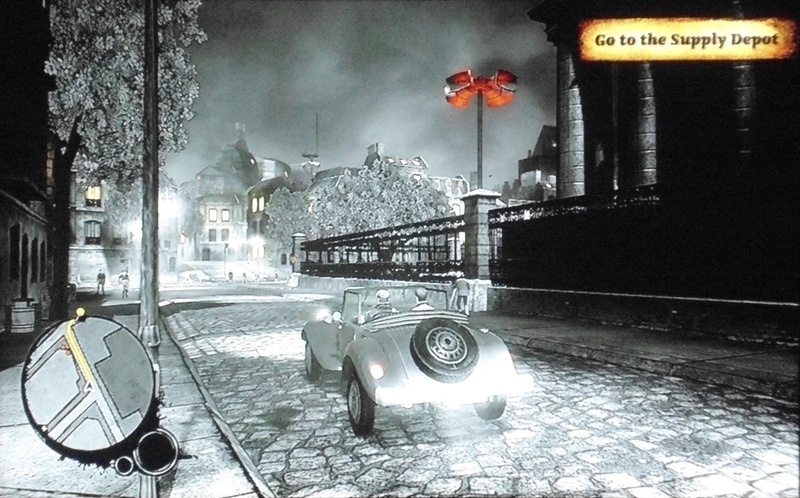 As with Mafia II, The Saboteur indulges in the mixed blessing that is vintage vehicles. However nicely they add to the period detail, there’s no denying that a lot of them are rather slow and clunky for comfort, but the problem is not as pronounced as in the aforementioned title because developer Pandemic has shown some sense in keeping long-distance drives to a relative minimum. Once you start making some headway, there are some nifty motors to be found, all of which can be saved and spawned at your leisure should you manage to bring them back to a safe house garage. They range from crummy runarounds to Nazi tanks and Gestapo cruisers, as well as some chic race cars that are bags of fun to pilot. It’s a bit of shame there aren’t more than a trio of country races to enter, as they’re a nice change from all the sneaking. Devlin aside, the character models are pretty poor and buildings aren’t blessed with the close-quarters detail or intricate finery of similar titles. It’s hard not to be impressed by the sum total of the city’s contents though; the potential for destruction and the seamless melding of colour with black and white is fantastic. There’s a pleasant sense of bustle to the streets too, meaning Paris never feels empty. Dramatic thrums and vintage songs on the radio set the tone, though the voicing isn’t so adept. Devlin sounds like an aggressive Father Ted misfit and everyone else like they’ve based their idea of Frenchness on ‘Allo ‘Allo! With well over 1000 ‘ambient’ challenges to be found through the city, completists will have plenty to busy themselves. They chiefly involve bowling up Nazi sniper posts, propaganda speakers, armoured vehicles and fuel depos. It’s quite a bit of fun, especially planting several explosives, sneaking off to a safe distance and then admiring your handy work as they all go up together. The stunt jump challenges are the one serious let-down of the ambient selection; an uncomfortably modern inclusion that feels completely tacked-on, with the lame accompanying slow-motion effect charting your car’s tired limp into a tree or otherwise-awkward piece of scenery is just embarrassing. Despite some irritations, freeing the city bit by bit is satisfying enough to keep you coming back for weeks; it’s a fairly meaty experience next to many of its contemporaries. Whilst the story only very occasionally features notable sections (chasing villain Dierker through a burner zeppelin is one such instance), there’s an atmosphere subtly crafted by all of The Saboteur’s little touches than means playing it to its conclusion is certainly no hardship. 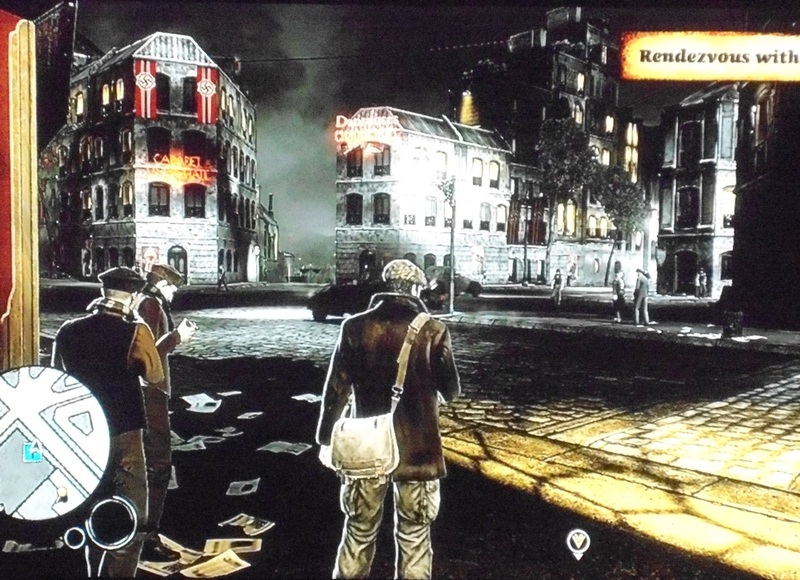 More destructive and clever than your average open-world game, The Saboteur is tainted slightly by some needlessly lackadaisical platforming and a lack of inventiveness in its narrative. Worth a go. monochrome, punctuated by shock-red swastikas and symbols of oppression..."